If the sign of a company going places is innovation, then Bosphorus is on its way quickly. It's managed to create yet another characterful range in the Black Pearls. The hats don't cut through brilliantly. Back in the July, we noted Bosphorus' claim that its Master Vintage series cymbals were the company's absolute finest work, and found it hard to disagree. Never given to resting on its laurels, though, Bosphorus has applied the lessons learned in creating the Master Vintage range to produce its Black Pearl cymbals, a 'hybrid' range that sits between the Master Series (lathed) and Master Vintage (unlathed), hoping to capture the richness of the former and dark tones of the latter. "Struck with some welly it becomes quite fierce, but never uncontrollable, its hybrid design giving it a more cutting voice than the Master Vintage"
Uncasing the cymbals was a bit like finding a pearl in an oyster (if you discount the gunky bits) - the hard case opened to reveal the gleaming delights within. We've been sent whatever the Turkish equivalent of a smorgasbord is - a selection of Black Pearl cymbals. 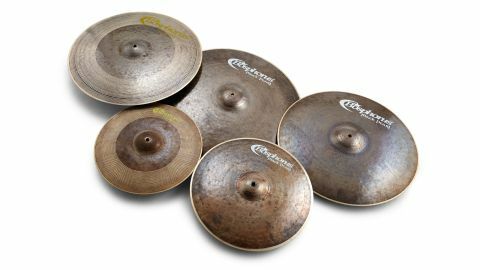 The Black Pearl cymbals share the organic, unlathed look of the MV series, though the finish appears darker - though whether that's the power of suggestion as a result of the name remains to be seen! We have 22" and 19" rides, 20" flat ride and a 16" crash, and 15" Black Pearl hats. They have about a 5mm lathed band around the edge, but other than that the bows are completely unlathed. We set up the 22" and 19" Black Pearl rides first, and the 15" hats too. First impressions are that the darkness of the Master Vintage series is ever-present - the 22" having a pronounced 'tah' when struck on the bow that evokes endless late-night jazz sessions, but open it up and it begins to roar in a way that the Master Vintage ride never did. Struck with some welly it becomes quite fierce, but never uncontrollable, its hybrid design giving it a more cutting voice than the Master Vintage. The 19" is more tightly controlled as a result of its smaller diameter but more than capable of holding its own as an only ride - perhaps more of a 'ping' than the 22" but a cleaner crash too. The hats are very dark, and struggle to cut through, at their best half-open and sloshing, rather than being quickly opened and closed. The 16" Black Pearl crash is very powerful but has a very quick decay, meaning it works well to accentuate accents. Finally, it is the turn of the 20" Black Pearl flat ride, a cymbal that perplexed and confounds all who play it. Ultra dry, with none of the glassiness you often find with flat rides, it seems limited to a restrained 'teh' until you crash it. "Crash a flat ride?" Yep. Crash it across the edge and it comes to life, a sort of 'whoompf' sound that decays quickly but sounds like a very refined china - the kind of filtered sound that works well in electronic music. It is possible to make even crazier sounds using it, as we discovered when removing it from the stand whilst still ringing - it was so thin it wobbled, giving a weird and wonderful overtone.